of jobs created during construction and once the facility comes online. 4,752 square feet of office space. their granulated sugar business.lick edit button to change this text. Sweet Brew Tea & Sugar Company, which is based in Loxley, Alabama, sells and distributes a patented system for brewing sweet tea and lemonade in commercial settings. The company has a national distribution network, and offers custom solutions for restaurants, hospitals, convenience stores, large franchise chains, and entertainment venues. Sweet tea is currently the fastest growing beverage category in the U.S.
Fueled by demand and the popularity of their brewing system, the company began eyeing the construction of a second production facility. 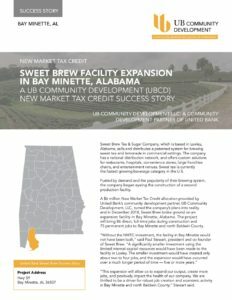 A $6 million New Market Tax Credit allocation provided by United Bank’s community development partner, UB Community Development, LLC, turned the Company’s plans into reality and in December 2018, Sweet Brew broke ground on an expansion facility in Bay Minette, Alabama. The project will bring 6 direct, full-time jobs during construction and 75 permanent jobs to Bay Minette and north Baldwin County. “This expansion will allow us to expand our output, create more jobs, and positively impact the health of our company. We are thrilled to be a river for robust job creation and economic activity in Bay Minette and north Baldwin County,” Stewart said. UB Community Development, a community development partner of United Bank, is dedicated to meeting the needs of our community. UB Community development serves communities throughout Alabama and beyond by providing funding solutions designed to increase economic development, create jobs and promote better access to goods and services. UBCD is currently using NMTC, Capital Market Funds and Community Facilities Lending Program to fund businesses and finance projects related to education, healthcare, manufacturing, hospitality, non-profits, community centers and more. Since 2016, the U.S. Department of Treasury, through its New Market Tax Credits Program, has awarded United Bancorporation of Alabama (OTC: UBAB), the parent corporation of United Bank and UBCD, $120 million in New Market Tax Credits allocations. 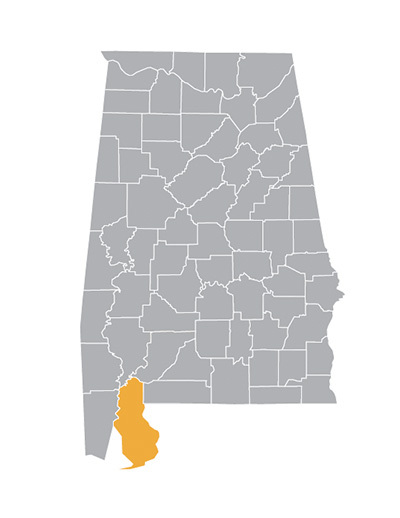 UBA, and subsequently UBCD, are the only Community development entities (CDE) headquarted in Alabama to receive a New Market allocation from Treasury in the last decade. This success was made possible largely because of United Bank’s designation as a Community Development Financial Institution (CDFI) and the organization’s unwavering commitment to its CDFI mission to bring positive and sustainable economic and quality-of-life improvements to underserved communities, not only in its traditional banking footprint, but throughout the entire states of Alabama and Florida. Additionally, UBCD, as the community-development management entity for UBA, manages a $40 million Community Facilities Lending Program, which provides accessible, low-cost capital to local government and non-profits in rural areas. Finally, UBCD also manages the $4 million Capital Magnet Fund Award that Treasury recently provided to United Bank. The CMF award requires UBCD, in conjunction with United Bank, to inject at least $40 million in capital to facilitate accessible, affordable and quality housing communities. Like the New Market Tax Credits awards, UBCD is the only Alabama-based entity to receive and administer these programs. UB Community Development’s strong history as an experienced leverage lender in New Market Tax Credit transactions, coupled with our passion for improving the communities we serve, have earned UBCD the reputation as Alabama’s premier financial partner for economic and community development.